PHOENIX – Salvador Macias knows all too well the lengthy, complicated and expensive process becoming a U.S. citizen can be. The DACA recipient now is a Phoenix attorney who has dedicated his life to helping others navigating the road to citizenship. Macias began his own journey when his parents brought him to the U.S. from Mexico in 1995. Although Spanish was his first language, he quickly learned English and caught up with his classmates, showing great potential. He credits his parents for his work ethic and a passion for education. But when Macias’ parents prepared to return to Mexico a few years later to buy a house with the money they had made in the United States, Macias’ teachers persuaded his parents to let him stay in the U.S. to explore his bright future. Macias had a dream now: to be president of the United States. But it wasn’t until his fourth-grade teacher, Ms. Ramirez, gave a lesson on what’s required to become president that Macias finally understood that that dream was impossible to achieve. She told the class that a candidate for president must be at least 35 years old and a resident of the United States for at least 14 years. Then she listed the final requirement: The president must be a natural-born citizen of the U.S, something Macias is not. His dream was crushed. Even at that young age, Macias knew he was an undocumented immigrant. 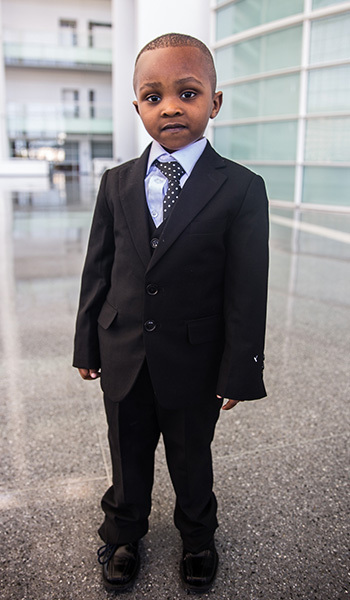 His parents urged him to stay silent. By the time he reached high school, Macias had become an outspoken activist for undocumented immigrants and Latino rights in Arizona. During that time, he decided he no longer wanted to be a victim, but instead represent and defend people in situations similar to his. On June 15, 2012, his life changed. President Barack Obama enacted the Deferred Action for Childhood Arrivals program – known as DACA – which protects certain individuals from deportation who were brought to the U.S. illegally, most commonly by their parents, as children and qualifies them for work permits. 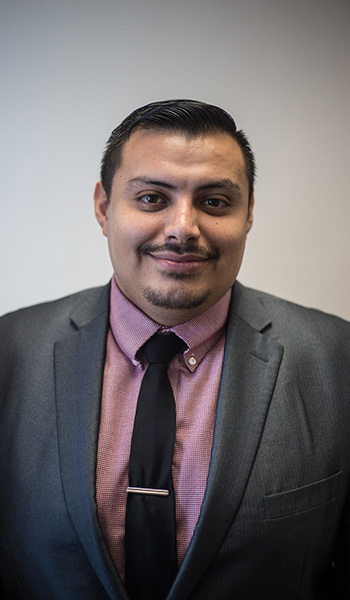 After DACA, Macias earned a law degree from Arizona State University, debt free, and was able to work. Macias now is an associate attorney for Ybarra Maldonado & Associates in Phoenix, representing clients in immigration and criminal courts. However, his personal future remains uncertain. DACA was rescinded in September 2017 by the Trump administration, leaving just more than 28,000 recipients in Arizona, and nearly 1 million nationwide, in limbo. There aren’t many ways for DACA recipients to adjust their status, Macias said, but a common way is to marry a U.S citizen or permanent resident. DACA recipients who entered the country legally with inspection by U.S Immigration and Customs Enforcement , through a visa and who choose to readjust their legal status can do so through a bona fide marriage to a U.S. citizen or permanent resident. • When applying for an adjustment of status, DACA recipients who entered legally do not have to leave the U.S. They can go to their local U.S. Customs and Immigration Services field office to adjust their status. DACA recipients or undocumented immigrants who entered the country illegally without inspection, who choose to adjust or readjust their legal status, still can do so through a bona fide marriage to a U.S. citizen or permanent resident but face many more challenges along the way. • If a DACA recipient or undocumented immigrant came to the U.S illegally, whether on their own or brought by their parents as a child, they must return to their country of origin and file to adjust their status at a U.S. embassy or consulate. This is the same case even if they were applying independently, with no marital status. • Once the applicant steps foot outside U.S. territory without travel documents, the applicant is subject to an automatic 10-year ban from re-entering the country, regardless of whether he or she illegally entered the country, either by choice or not. • “Extreme hardship” is not defined by immigration statutes and regulations, but it goes beyond financial hardship. One example could be if the person awaiting adjustment is the primary caretaker of a family member in the U.S who is extremely dependent due to health issues. In cases specific to undocumented immigrants and DACA recipients, Macias noted there’s no clear pathway to citizenship that does not involve marriage or a three- to 10-year ban on re-entry. During his presidential campaign, President Donald Trump vowed to reform immigration policy. Along with strengthening border security and limiting refugee resettlement in the U.S., Trump expressed the urgent need for a pathway to citizenship for qualifying immigrants, including some DACA recipients. For immigrants with legal resident status, whether through a business-sponsored visa, refugee or asylum status, or a relative-sponsored visa, navigating the citizenship process comes with fewer twists and turns. The Rwandan Genocide of 1994 resulted in the slaughter of more 800,000 members of the country’s Tutsi minority. Solange Habineza was only 9 when her older brothers, uncle and sisters were killed. She said she knew she wanted – and had to – leave. In 2009, at age 24, Habineza requested a U.S green card through the Diversity Immigrant Visa Program, which was designed to encourage immigrants from countries with low rates of immigration to the United States. After a year of waiting for her forms to be processed, she received her “golden ticket” to the United States. Receiving her card through the “green card lottery” was bittersweet. On one hand, Habineza had always dreamed of coming to America and was excited to start her new life there, but that meant leaving her family, including her mother and younger siblings. Habineza also left her life as a high school social-sciences teacher who helped coach soccer and volleyball teams. She made the trip to the U.S. in 2011, exchanging the mountain rainforests of Rwanda for the much flatter and nontropical state of Ohio. She started working at a Kohl’s warehouse as a product packer. Two years later, after falling in love with her husband Jean-Claude, Habineza resettled in Phoenix. She now works as a medical interpreter for refugees in the Valley. Her main goal, she said, is to help as many people as she can. Last week, Habineza became a U.S. citizen. 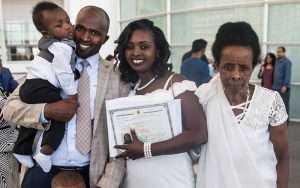 But before being able to apply for citizenship, Habineza first had to wait to change her status from green-card holder to permanent resident. She had to prove to immigration officials that she had been living in the U.S. for at least five years before she could proceed to the next steps. U.S. Customs and Immigration Services officials then conduct an interview to verify the person’s identity and to determine whether the applicant is of “good moral character.” Citizenship and Immigration mainly looks at criminal records to get a glimpse into a person’s past activity before approving them for the next steps. 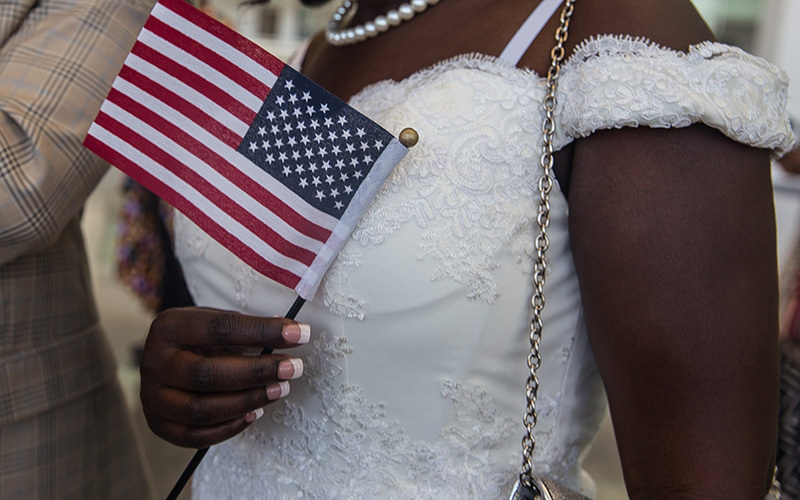 Filing more paperwork, demonstrating an ability to read, write and speak English and passing the citizenship exam are the final steps before a naturalization ceremony, where new citizens take an oath of allegiance to the United States. Unlike the 10-year citizenship process required for most undocumented immigrants and DACA recipients, the process for permanent residents could be as little as several months or close to a year. An increase in naturalization requests nationwide is partly to blame for the longer wait. Maria Elena Upson, a spokeswoman for the Citizenship and Immigration Services in Phoenix, said part of the reason current waiting times have increased is due to Trump’s tough stance on immigration, spawning a wave of permanent residents and immigrants applying for citizenship. According to Upson, Customs and Immigration Services has hired more workers to speed up the process, but vetting applicants has slowed the process.